The Green Pipe is widely recognised as a cost effective and environmentally friendly alternative for stormwater and drainage systems. Approved and used by councils throughout Australia for stormwater and sewage re-use systems The Green Pipe is providing a real opportunity for Government and non-government organisations to promote their green credentials. Their willingness to use quality, recycled products as an alternative to conventional virgin products will be widely recognised. Ease of handling solves many difficult access issues and at the same time reduces machinery requirements. Ease of installation will substantially reduce costs for all your drainage projects. The fully installed and lifecycle cost is lower than comparable products for most applications. Manufactured in 6 metre lengths creating fewer joints during installation, improving laying rates and minimizing potential leakage points. The Green Pipe is tough. Even the highest level acidic soils have no effect on it so that once installed it will last indefinitely. It is easily cut with a chainsaw, circular saw or angle grinder. The Green Pipe manufacture a range of fittings to suit most needs including bends, elbows, “T’s”, reducers etc. Due to the ease of cutting and welding custom made fittings are available at extremely competitive prices. The Green Pipe is used extensively throughout Australia as a crossing or culvert by primary producers, contractors, foresters and Government bodies. Combined with our 100% recycled plastic headwall to provide the total package The Green Pipe correctly installed with recommended minimum coverage and side compaction will carry the heaviest legally loaded traffic and provide many years of trouble free service under your roads. At just 60kg RPT headwalls are extremely tough and suitable for all pipes 250mm to 450mm in diameter. With a 75mm front lip to minimise washout and stabilising lugs for easy installation, our headwalls like The Green Pipe, offer a cost effective answer to the most difficult access installations. 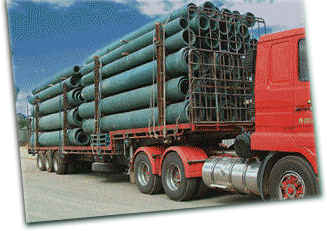 Using an Australian developed process The Green Pipe has been manufacturing medium to large diameter recycled plastic pipe at 32 Dawson St Moama, since July 1999. © The Green Pipe • Ph: (03) 5480-7060 during Business Hours or call our National Sales Manager on 0417 677 861.